The day after Gillard’s (now famous) ‘misogyny’ speech I woke up thinking I was in the twilight zone. Everyone I knew was amazed or affected in some way, yet, the morning news and papers barely referred to it, instead focussing on Slipper resigning? I was seriously, WTF? Thankfully over the next few days the so-called ‘serious’ media commentators were basically shamed into at least acknowledging it (even if in some terribly conservative white male stances) by social media and overseas media. This whole #Ashbygate (as it is referred to on twitter) episode is a major déjà vu, the only difference is, not only am I am in the twilight zone, I am outraged! At Sydney University in the early 1970s a course simply called “Government” was offered to economics, arts and law students. It was a time of social upheaval and the election of the Whitlam Government had ended 23 years of conservative rule. The Murdoch press had backed a change of government. My tutor in Government, Lex Watson, a gay rights activist, had set us a task: to identify bias in the media. But as left-wing as Lex was, the six-week project wasn’t about left versus right, it was about the techniques used by the print media to slant a story to suit an editorial position. A Federal Court Judge has found a conspiracy by James Ashby, Karen Doane, Mal Brough to advance their own interest and that of the LNP. 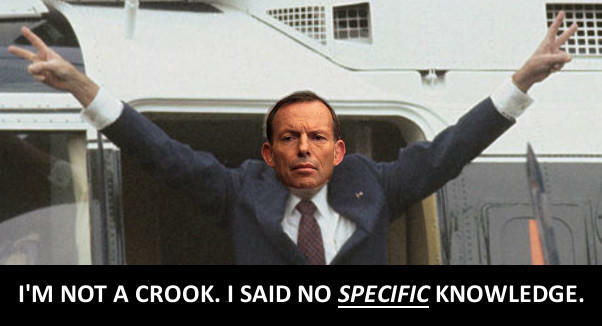 Mr Abbott maintains that he had no specific knowledge. Here is a timeline & questions. This timeline will not cover every detail, as all of this was already covered extensively in the court case ruling as well as the media. What is covered is some of the aspects of the timeline which do not receive as much attention for whatever reason. There are some questions on the record from Twitter below in the second section. Please feel free to add some more under the hashtag #AshbyQuestions after reviewing some of the info in here. Also please feel free to suggest more relevant facts that should be added to the timeline. A crowd-sourced effort has more chance to get the public record right. Mr Abbott and Mr Slipper were best friends. Here seen in happier times. The Watergate scandal was, apparently, rather big news at the time. People went to prison, the President of the USA was forced to resign and investigative reporters, Bob Woodward and Carl Bernstein became household names. Nixon’s Republican party came undone through a conspiracy to find dirt on their rivals in the Democratic Party. Dirt that was to be used in an election smear campaign. In the end, they sufficiently smeared themselves out of office, when Nixon’s replacement, President Ford, lost the 1976 election to Democrat Jimmy Carter. As scandals go, I can see that this one was very newsworthy. When President Nixon said he had no knowledge of the conspiracy, it took the work of investigative journalists to prove he was lying. Woodward and Bernstein investigated this conspiracy for two years. It was the story of their careers. 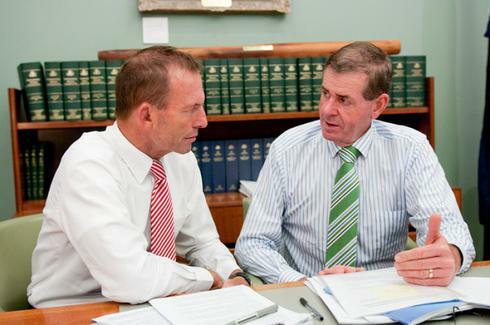 Mr Abbott on #AshbyConspiracy: This is a tawdry state of affairs, to say the least. This shows our esteemed mainstream media at work. It is a study in how the press makes sausages. We have our very own Australian Watergate minus investigative journalism. What happened? Where did it go? Does mainstream journalism still exist or is it now left to the Fifth Estate, social media, blogs, twitter to do their work.